SeatGeek, one of a raft of ticket comparison and price forecasting sites for sporting and entertainment events, has been pushing the edge with a combination of powerful data, great design and key partnerships and investments. The New York startup announced Tuesday that it has secured an undisclosed investment from Ashton Kutcher and Guy Oseary’s A Grade Investments. The latest funding highlights the momentum of SeatGeek, which is like a combination of Farecaster and Bing Travel for event tickets. 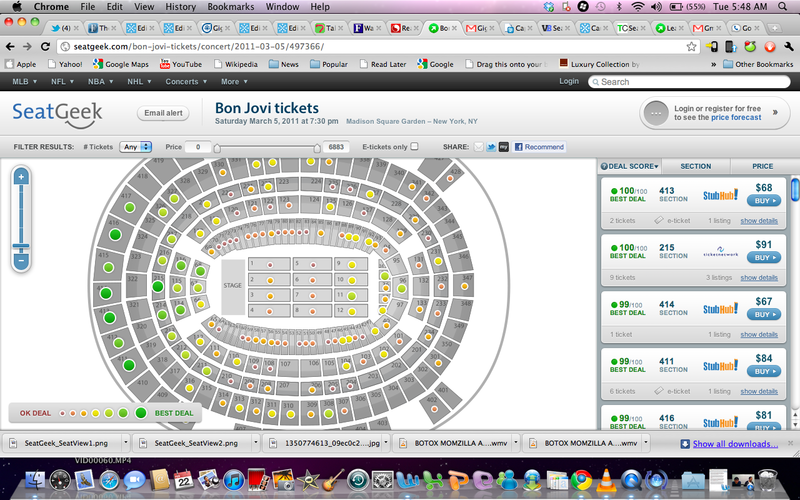 The site helps users find the best deals on upcoming tickets from dozens of secondary ticket markets. The start-up has been on a roll, securing partnerships with the Wall Street Journal (s nws) and Yahoo Sports (s yhoo) to power their scheduling and ticketing services, which help consumers find tickets for upcoming shows and events. Tuesday, the company announced it has inked another deal with fast-growing sporting site Bleacher Report, one of the five biggest sporting publications online. 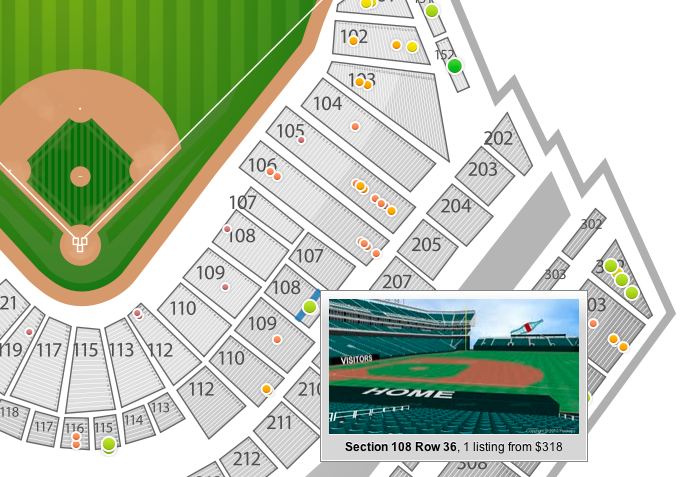 The site, which is free for users, is also adding 3-D seat views on the website rendered by start-up Fanvenues. The improvements underscore the elegance and simplicity of SeatGeek and show how the company uses data effectively without overwhelming users. It’s one of the reasons I’ve been attracted to the company, because it marries lots of data with smart design. You can hear about more great uses of big data at our Structure Big Data Conference on March 23 in New York. SeatGeek customers see color-coded listings that factor in the distance of the seat to the action, viewing angles, and the number of seats being bought along with historical pricing data to create what’s called a Deal Score metric. Using algorithms that factor in historical pricing data, SeatGeek can offer predictions on whether tickets are likely to rise or fall, which the company says is more than 80 percent accurate. SeatGeek co-founder Russell D’Souza said the site works because the data is used in service of a great user experience. He said SeatGeek has worked hard on the interface and actually hid some of the more raw forecasting data it provided users last year. After cloaking some of the intricacy, it boosted conversion of ticket purchases by four times because of the more streamlined experience. D’Souza said the company hopes to use the latest investment to grow its team beyond the current 12 employees, cover more events and venues, and eventually expand to Europe. SeatGeek has previously raised $2 million from Founder Collective, NYC Seed, Stage One Capital, Trisiras Group, PKS Capital and angel investors Arie Abecassis, Sunil Hirani, Thomas Lehrman, Allen Levinson and Mark Wachen. D’Souza declined to say how much A-Grade Investments is providing in funding, but he thinks Kutcher and Oseary’s social media savvy and entertainment clout can help SeatGeek reach out to new users. Why the Hoopla About Hadoop? Congrats to Team Seat Geek!. Good to see follow co-located (Seat Geek was here till dec 2010 at Soho Haven which is now Projective Space) startups growing leaps and bounds! we will miss you guys at beer pong in our next upcoming party in our happening office loft ! NICE! Congrats Russ, Jack and team – great work for the NYC startup ecosystem!